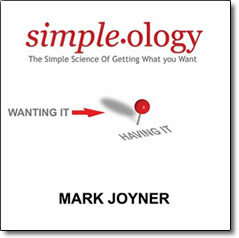 Simpleology – by Mark Joyner – CDs or MP3 – Discount! The Simple Way to Achieve Personal and Business Success! Simpleology is that cutting edge speed-learning psychology which governs success of failure in every endeavor. It provides the explanation for thos sho succeed in life…because consciously or unconsciously they have been following these 5 laws, and those who face failure have been breaking at least one of these laws on a regular basis. Success is simple, and scientifically reproducible, if you know the “5 Laws of Simpleology.” Simpleology proves that success and happiness are easier to achieve than most people think. In fact, people can almost guarantee their own success simply by following a few simple rules. These laws aren’t new; they’ve been around forever. Throughout history, they have helped the world’s greatest minds amass fortunes and forge new paths. Applicable to any challenge or goal and irrefutably commonsense, these 5 laws form the basis for almost any successful person or endeavor. Accomplish 3 times as much in 1/3 the time as you attain total mastery of Time, Energy, and Money!